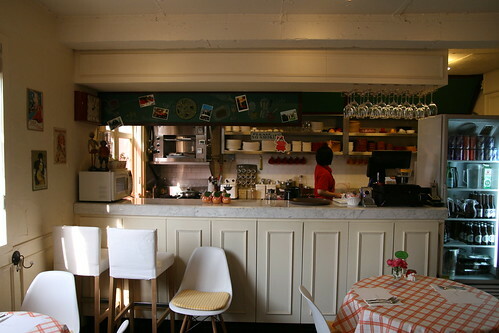 Just round the corner from the main street of Itaewon is the incredibly tiny, yet incredibly tasty Mi Madre. This small Spanish bistro makes up for lack of space with delicious rustic food. Catalonian cuisine comes cheap at Mi Madre with their weekday lunch set priced at a very reasonable 9,500 won: Chicken and seafood paella, plus a dish of tapas and a coffee. Paella Mixta (Chicken and Seafood Paella) 14,000 won (9,500 won at lunch time). On recent visits there we've ordered a number of different dishes and due to various companions' diet restrictions we have been cheeky and asked for removals and substitutions. Paella without the chicken? No problem! 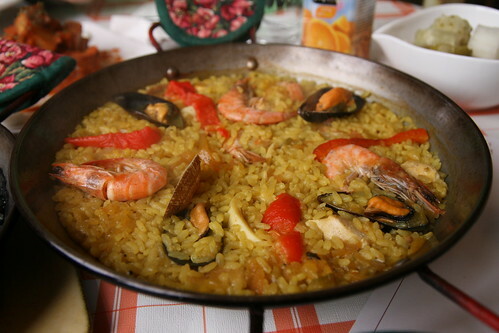 Paella without the chicken and the seafood? Also no problem. Mi Madre were very accomodating with our requests and the service is always warm and friendly. 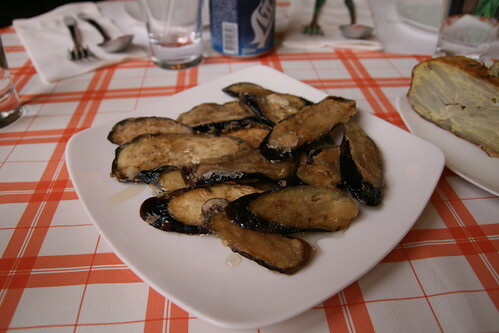 Berenjenas con miel (Fried eggplant with honey) 6,500 won. Patatas Bravas (Deep fried potatoes with spicy tomato sauce) 8,000 won. 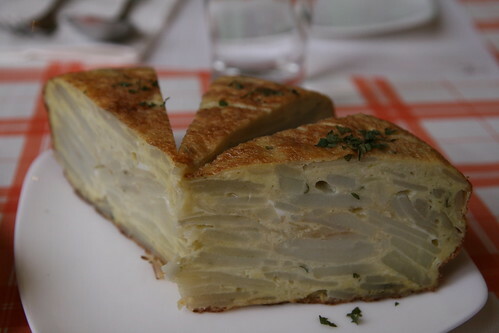 Tortilla Espanola (Potato and onion omelette) 5,000 (or part of lunch set). Ordering a la carte gets a little pricey at Mi Madre, with each tapas ranging from 5,000-10,000 won on average. However the addition of one or two of these little beauties to your meal is worth the extra expense. The fried eggplant with honey sounds like an unusual combination, but it works well, sweet meeting savoury in a crunchy, sloppy, gloopy, glorious mess. 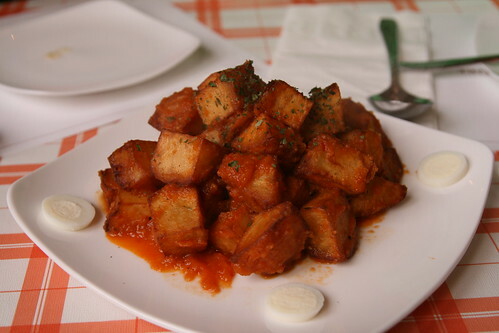 The fried potatoes are not too spicy and still hold their own under the rich tomato sauce. The omelette is cooked to perfection and came with our lunch sets. Patatas Con Carne (Meat and potato stew) 9,500 won. Vegetable Paella (Made on request) 9,500 won. 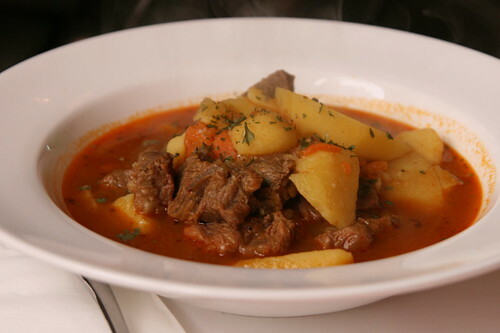 The meat and potato stew is filled with big chunks of tender beef and tastes of home. Warming comfort food for those needing a bit of stewy love in their life. 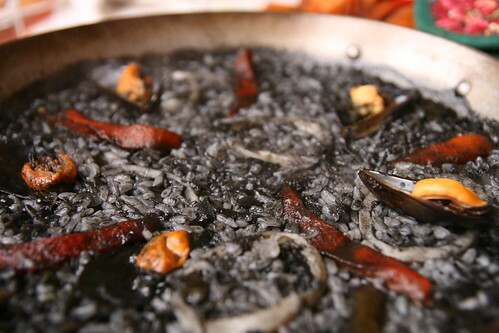 However, the stars of the show are the paellas. 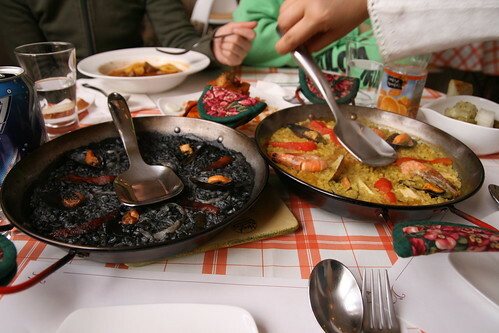 Whether you choose the chicken and seafood or the squid ink paella (or even the cheeky veggie paella) you are onto a winner. Perfectly cooked saffron/ink coloured rice giving you a taste of Spain. 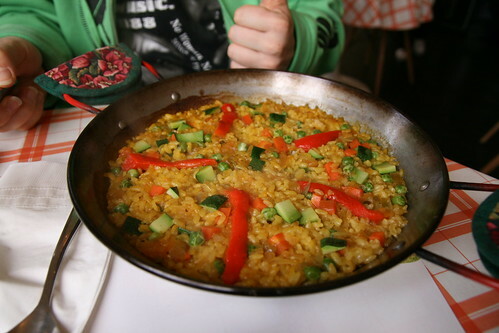 Far superior to the other paella offered in Itaewon (At La Plancha), this is the reason to visit Mi Madre. 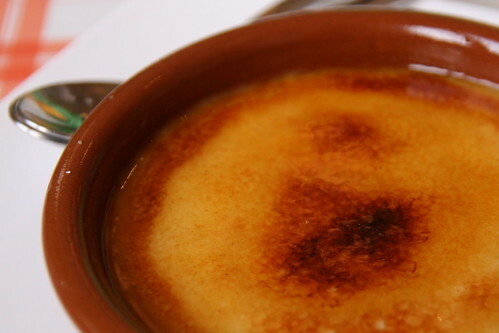 Crema Catalan is the only dessert on offer here and to be honest it was the one dish that slightly disappointed. 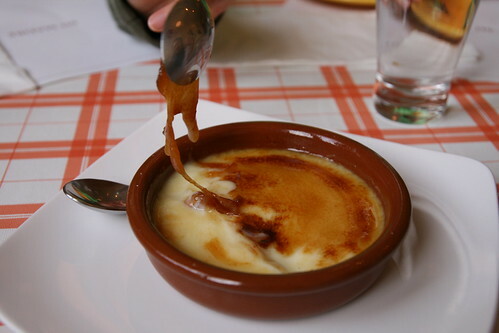 The custard was delicious, but the caramelized sugar was still very sticky, it lacked the crackling crunch that a good creme brulee or crema catalan should have. 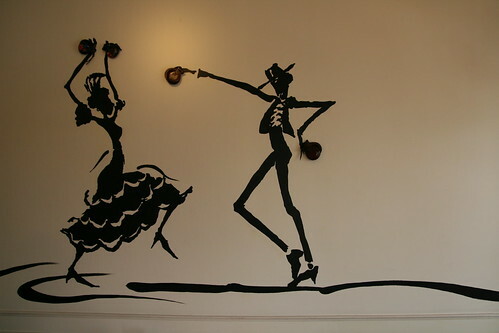 Visit Mi Madre for a taste of real Spanish food at half the price of other Itaewon restaurants. 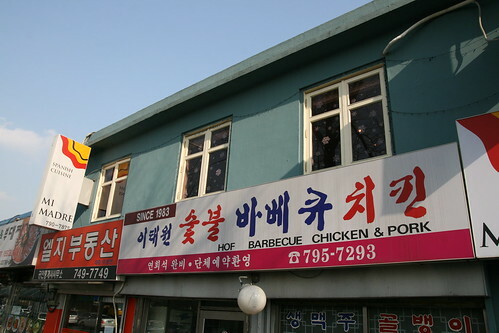 To get there take the subway to Noksapyeong station and head down towards Haebangchon. Mi Madre is on the right hand side of the main road just past Italonia and Thunderburger. If you hit the tiny Buddha's Belly cafe, you have gone too far. Contact them on 02 790 7875. Our conversation on this topic was interrupted by the demands of proofreading yesterday, but a quick Google search allowed me to finish the chat (so to speak) without harrassing you further. I hope you enjoy it, we've always had good experiences there.